The Fight Night 23 event last Saturday was a blast. Melvin Guillard's victory led him to get the whooping $30,000 bonus. Melvin Guillard, Yves Edwards and Cody McKenzie lead the pack of the “UFC Fight Night 23: UFC Fight for the Troops 2″ $30,000 “Fight Night” bonuses recipients. Guillard was awarded with the “Knockout of the Night” award while Edwards grabbed the “Submission of the Night” bonus and the “Fight of the Night” award to opponent McKenzie. UFC Fight Night 23 concluded last Saturday at Fort Hood in Killeen, Texas. It served as a fund-raiser for UFC’s auction for the Intrepid Fallen Heroes Fund. The main card aired on Spike TV while the prelims streamed on Facebook. 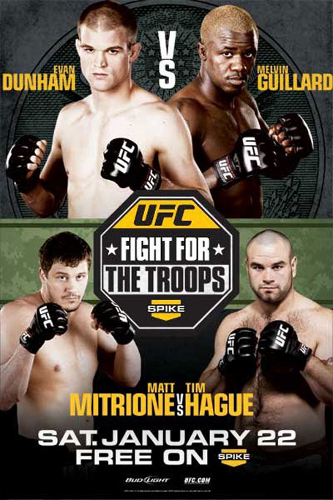 Guillard earned his bonus via first round KO over Evan Dunham in the night’s headliner. Edwards on the other hand, earned his bonuses with a victory on the night’s featured prelim fight. McKenzie got the honors even though he lost his fight via second-round rear-naked choke.